Responsive tables are a big challenge. Tabular data is often very important and you don’t want to hide the data just to keep the nice responsive design in shape. Currently within Drupal I am not aware of any defacto solutions. I experimented with jQuery Mobile’s technique table reflow, the footable module, and lastly Zurb’s responsive tables. I had one criteria for a successful solution; my users should not have to do anything to make their table responsive. I did not want them to right click on the table and add a class, I didn’t want them to have to build all of their tables with views, just plop in a ckEditor table and hit save. A secondary criteria was that the solution should be lightweight since it is primarily to be used by users on mobile devices and we don’t all have 4G LTE in our offices and living rooms as of yet. All of the solutions mentioned above use some sort of CSS hook to indicate that the table needs to become responsive at certain breakpoints. The lightest weight solution for me turned out to be Zurb’s approach. To automate the insertion in the HTML of a CSS class I turned to the Flexifilter module. Not enough people use this module but what it allows you to do is to create a Drupal input filter, so really an output filter, on anything that is formatted, like your WYSIWYG output. 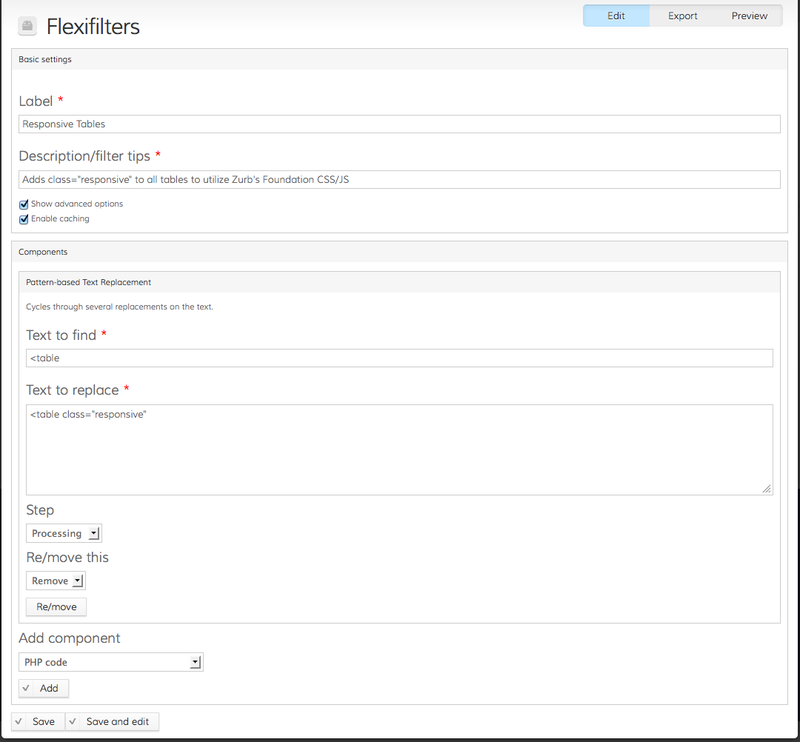 After enabling the module you need to go to Structure -> Flexifilters -> Add New Flexifilter. Inside of a filter you have several options but the Pattern Based Text Replacement widget works with regex. Once a filter is configured, you have to enable it. Once enabled, head over to your text format configuration screen and enable your new filter. Configuration -> Content Authoring -> Text Formats -> Full HTML. I put the filter as the last item to be ran so that I can ensure the class I want added is actually added. Enable the text filter and place it as the last filter to run. So now we have a class called responsive being added to tables folks create. How does this help us? We need to leverage Zurb’s great work to answer that. You can grab the source from their GitHub project page. We want two of the files, responsive-tables.css and responsive-tables.js. You can discard the rest. Place the css file in your theme/css directory and the js file in your theme/js directory. This allows the code that the Zurb folks wrote to run without conflict with the other jQuery that Drupal executes. That is pretty much it. Save those files. Go to Structure -> Appearance to reload the info file and your table should now be responsive at small window sizes. 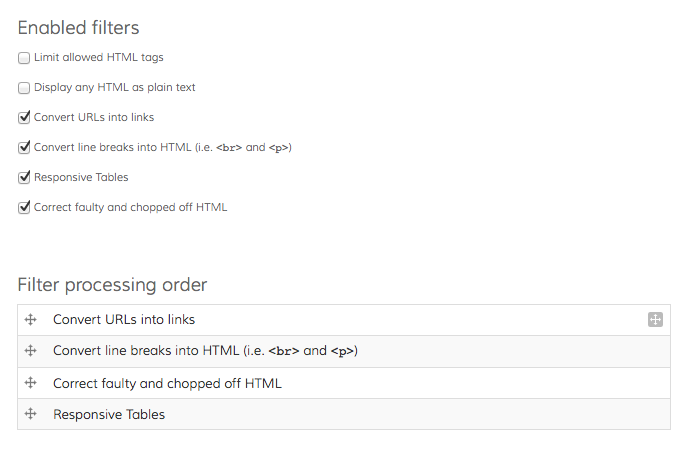 Zurb style responsive table in Drupal 7.20. Echoz had demonstrated responsive tables to our local group on a few months ago. That’s a great use of flexifilter. Drupal integration is awesome. There are so many approaches to the responsive tables. No great design pattern has emerged. Mobile search where you can choose multiple sources to search are also a challenging design pattern. Can you help me? Thks! //all of the other code from responsive.js goes here. //make sure to close above function. I hope that helps. I can’t see the code you linked too as it is from your local server but the site you have associated with your name looks great. Warning: Invalid argument supplied for foreach() in flexifilter_invoke_components() (line 322 of /customers/2/c/2/lysetskanal.dk/httpd.www/sites/all/modules/flexifilter/flexifilter.module). So thanks for your guide here. Now I will invistigate the picture module with inline images. I have followed the instructions in the tutorial and everything went smoothly. I am finding that I am not getting horizontal scroll bar on the bottom of the columns after the first column, as shown in ‘Screen-Shot-2013-02-26-at-4.33.17-PM.png’ above. Any thoughts as how I may add this? Every Drupal theme I believe has a .info file. In your sub-theme it should be named “sub-theme-name.info” most likely without the hyphens. You have to add a line to the info file telling it where that JS file is located. Here on line 88 you can see where it has been added in our basic Zen sub-theme. jQuery 1.7 will work great, it is what I use too. Once you add this file to your info file you will want to clear your cache or visit the Structure->Appearance page to make sure the JS is loaded. the only downside is that I need Tables only for a few pages may be, and don’t want extra .js and .css to load on every page, but only on those…. may be any better solution? Red, CPN is a nice module for doing exactly what you are hoping to do. Also, if you use panels, you could make a variant for the few table based pages and inject your CSS that way. Alternatively, you could make a few custom .tpl files for the nodes you want to effect and then add the js to those custom templates. I just tried making this work, and I get a similar error message to Dan last year. I have gone through the steps and recommendations carefully, but still get the error. Using jquery 1.7. I use CKEditor, particularly for tables. Should this matter?